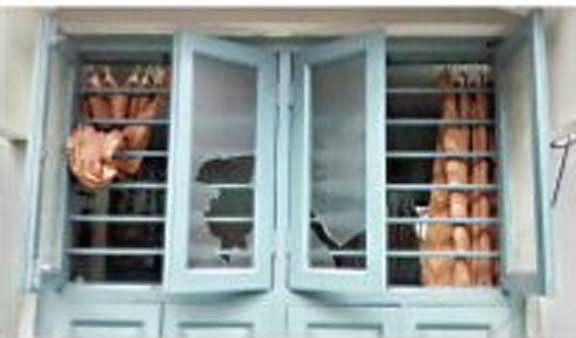 Puducherry: In the wake of suicides by two sisters of the Ashram along with their mother, properties of the Sri Aurobindo Ashram were again attacked by miscreants on Tuesday. Due to the stone-pelting the window panes of ‘Splendour Auroservice’, an ashram showroom of its products on Beach Road and a Guest House ‘Oriya Nilayam’ suffered damages. Police said that damages were caused by some unknown persons at around 4 to 4.30 am. While ‘Splendour’ was locked, ‘Oriya Nilayam’ was housed with tourists. The stones after breaking the glass fell inside the rooms where the guests were staying. However, no one was hurt in the incident. No case was registered as there was no complaint from the Ashram, said the police. Earlier, the main building of the Ashram, adjoining the ashram school, Honesty departmental stores, New Guest House and a small tea and snacks shop were damaged by protestors who took to stone-pelting. Police arrested 10 persons in connection with the protest and stone pelting. In the case of ransacking of the petrol bunk and damaging of the Honesty Departmental Stores, though cases were booked, no one was identified or arrested. In the remaining incidents, no case has been registered as there has been no complaint, police said. Puducherry: Social organisations here on Tuesday petitioned and urged Chief Minister N. Rangasamy to ensure all facilities and security to the sisters evicted from the Sri Aurobindo Ashram to enable them to lead a normal life from now on.